Published September 7, 2015 By Anna T. This post may contain affiliate links. Regardless, I only recommend sites I've researched and/or used and trust. Some companies are proud of the fact they allow all or most of their workers to telecommute. And then there are other companies that offer work at home jobs regularly, but they don't go out of their way to advertise that fact — possibly because they don't want to get overwhelmed with applications, or because they don't always have home-based jobs. 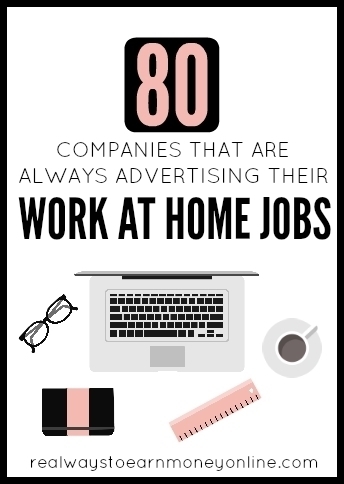 Today I made list of companies that are always advertising their work at home jobs. These are all completely legitimate companies, and they make it very easy for you to find all the details about their home-based jobs on their websites. Unlike other companies, the ones in the following list want you to know they allow working from home and you won't have to jump through hoops trying to find those jobs. In the list below, I've broken the companies down by category and provided a link to their websites and also our review (if there is one posted). Most of the following companies hire for either customer service, sales, and/or tech support. You will most likely need some type of headset, a quiet background, and a high-speed Windows-based computer (there may be a few exceptions on that below). The experience you need will vary. Many will require at least a little bit of past customer service and/or sales experience while others may be entry-level. It surprises me that I can never find too many chat-based home jobs, especially since so many companies these days have the little chat pop-up when you land on their sites. I have a list here with a few others in addition to what's below, but the two below are the main ones with ongoing openings. Hotel Tonight – Read Hotel Tonight Review – Occasionally has some live chat positions open for various locations across the US. The following companies are almost always looking for work at home transcribers. Most will require you to have transcription equipment — a foot pedal and headset. The work is of the flexible, do it whenever you want variety, and you will be working as an independent contractor. The following companies are usually hiring online academic tutors. Requirements to apply will vary, but in most cases they prefer people who at least have at minimum 4-year college degrees. Some, but not all, will additionally require past teaching or tutoring experience. The following companies are usually looking for online ESL (English Second Language) tutors or teachers. Note you do not need to know another language to get these positions — you just need to be fluent enough in English that you can help non-English speakers become more fluent themselves. The following companies usually have openings for writers. You'll notice most of these are content sites — which means a lot of what you do may be ghost writing and also may not pay very competitively. However, having access to the sites below can help provide a lot of supplemental income. Some people do write for content sites full-time. Another good thing about the companies below is that you can usually get in even without past writing experience. If you'd prefer to go into business for yourself as a writer and accept private clients (which almost always means more money), you should read Gina Horkey's story and consider taking her course. The following companies usually have an ongoing need for remote editors and proofreaders. The pay is usually pretty competitive, and you'll find that most of these companies will require either past editing experience or a degree before they'll consider you. You can visit the websites for the following companies at any given time and see that they are advertising for remote virtual assistants. Just as it is with freelance writing, you can make more money working for yourself as a VA than you generally can working under a large company. Still, the companies below may come in handy if you need experience as a VA and additional income before making the decision to start your own VA business. These companies almost always have openings, sometimes worldwide rather than just in the US. You are usually evaluating web search or social media results. Sometimes there may be other types of tasks listed. Pay tends to be competitive, but the downside is that work and projects may come and go, so they are not safe positions to depend on. You do the work as an independent contractor, and most of these companies also prefer to hire people who have smartphones. Good luck! I cannot promise that all of these companies are hiring right now, but I can say that they usually are. Please comment below if you know of other work at home companies that are always advertising their job openings. Looking For Even More Companies Always Hiring Home-Based Workers? Another excellent resource for this is FlexJobs. I've been a member here for over a year and I absolutely love it! Many well-known companies choose to post their listings at FlexJobs each time they have openings because it is one of the most reputable job sites on the web for people who are seeking primarily work at home jobs and/or flexible work. Also, FlexJobs is one of the only job search sites in existence that can absolutely guarantee you'll find no scams on their site, thanks to their team of workers who hand-screen absolutely every submission for legitimacy. Thanks for legitimate sources for income. I got hired by Rev.com as an independent contractor and it’s not as easy as I thought it would be, but it’s definitely fun and doable. I don’t think you can count on it as steady income (as the review also says) but it works for me for now–thanks! Thank you I did all the process and training for Appen and I start tomorrow on a project as an Independent Contractor. Thank you so much.